Alpesh Trivedi believes the HVAC sector is on the cusp of an enormous technological revolution, driven by digitisation. He explains how it will impact on building services. We are at a defining moment in terms of the way the HVAC sector operates digitally, and widespread interconnection of systems becomes progressively more common. The technology that allows digital interaction – equipment embedded with electronics, software, sensors and actuators, enabling it to exchange data – is set to dramatically change the way we do business. A building management system (BMS) controls a range of building services including HVAC; lighting; fire, smoke detection and alarms; security and access control, and lifts. It can also be monitor and control power distribution, energy consumption and uninterrupted power supplies and is sometimes referred to as a building energy management system. Designed for single- and multi-zone applications, most light commercial controls systems connect to a range of mechanical and electrical equipment, controls and sensors using wireless communication that significantly reduces installation costs. The term ‘building energy management system’ (BEMS) is often used interchangeably with ‘building management system’ (BMS). However, a BMS can be used to monitor and control a wide range of building systems whereas a BEMS refers specifically to energy-related systems such as HVAC, lighting and power. A BMS can provide energy cost savings of 10-20% compared to standard controls and can repay capital investment in two to five years. It enables comfort conditions to be monitored and controlled from a single point and enables easy allocation of energy use to specific cost centres and can easily be extended to cover future expansion and/or accommodate changing requirements. Historically, BMSs have been associated with large commercial buildings. However, as equipment has become easier to control, monitoring and detection has become less expensive, and wireless technology has become available, buildings of all sizes are having increasingly complex control systems installed. Industry 4.0 – which essentially means data exchange and the automation of manufacturing technologies – has resulted in HVAC equipment manufacturers embracing the digital world. Industry 4.0 is often called ‘the fourth industrial revolution’ because it follows the first industrial revolution (starting with the invention of the mechanical loom and steam engine), the second (mass production assembly line manufacture and electrification) and the third (the integration of programmable logic controllers, computers, automation and IT). Cyber-physical systems – mechanisms controlled or monitored by computer-based algorithms. The Internet of Things – the interconnection via the internet of computers embedded in everyday objects, enabling them to send and receive data. ‘Cloud’ computing – using a network of remote servers hosted on the Internet to store, manage, and process data, rather than a local server or a personal computer. Additive or 3D manufacturing – where material is joined or solidified under computer control to create a three-dimensional object. Cognitive computing or artificial intelligence – simulating human thought processes in a computerized model through machine learning. On the face of it, Industry 4.0 is off to an uncertain start. After all, buildings consume two-fifths of the energy consumption in the commercial sector and only fifth of commercial buildings have a building management system. But connected buildings are developing thanks to the introduction of smart equipment which essentially brings intelligence to individual devices in the field. 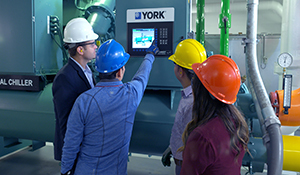 An example is a connected chiller that can report its performance, including any problems or malfunctions, on a regular basis to the service technician or facility manager. The ability of the equipment itself to report on its performance and on potential problems is a crucial benefit for building owners and facility managers. Because facility staff no longer has to visually inspect each piece of equipment to detect operating issues, they can more quickly determine where to focus their efforts. While other technologies, including BMS and cloud-based solutions, can deliver some of this information, the implementation of smart equipment promises to increase the ease and cost-effectiveness of taking corrective action before a potential problem affects a building’s performance. Building-wide smart systems integration helps reduce operating costs and the risk and complexity of technology integration. It also lowers capital and lifecycle costs and increases the return on investment of the technology. Service quality – excelling across all areas of the activity, not just of the product, but also in terms of business relationships, support, and back up. Depth and breadth of experience – with an established presence in the market with acknowledged expertise. Partnering potential – in other words, a manufacturer with the financial muscle and global reach to weather economic upheaval. My own company has introduced its own branded ‘Smart Equipment’ to seamlessly connect to a controls system. The equipment can self-identify without requiring programming tools. When installers bundle Smart Equipment with a controls system, they can connect data streams from equipment to the cloud, allowing unprecedented insights into operations.